You will find the Delivery Date Field on the Checkout page of your store. Yes, you can exclude the weekends by not selecting Saturday & Sunday (or any weekdays) in the Delivery Days field on the WordPress admin side under Order Delivery Date -> General Settings -> Date Settings page. Yes, you can set a minimum delivery period in hours, which will be taken into consideration before showing the earliest available delivery date or time slot to your customers. This can be done under the "Minimum Delivery time (in hours)" field under the General Settings -> Date Settings tab in the Order Delivery Date on the admin side. Minutes will be accepted in the decimal format like for 30 Minutes you can use 0.50. Yes. You can show limited dates to your customers to choose for delivery. You can set the value of the number of days that you want in the "Number of dates to choose:" field under General Settings -> Date Settings tab in the Order Delivery Date on the admin side. By default, your customers can choose a delivery date from the next 30 available dates. Yes, the Delivery Date and Time will be displayed in the order notification emails sent to the customers as well as the admin. Can my customers place an order without choosing a delivery date and time? Yes. Customers can place an order without choosing a delivery date and/or time. To achieve this, the "Mandatory field" option should be disabled. It can be found in the WordPress admin under Order Delivery Date -> General Settings -> Date Settings page. Yes, you can restrict the number of deliveries for a delivery date. You can set the number of deliveries in the "Maximum Order Deliveries per day (based on per order)" field under General Settings -> Date Settings tab in the Order Delivery Date on the admin side. A delivery date will be disabled for further deliveries in the calendar after this number of orders. To restrict the number of deliveries based on the cart product quantities, you need to check "Enable Maximum Deliveries based on per product quantity" checkbox under General Settings -> Date Settings tab. The working days of my company are different than the working days of my shipping company. Can I add them differently? Yes, you can set your company's working days and shipping company's working days differently. You can set up this under Shipping Days section under General Settings -> Date Settings tab in the Order Delivery Date on the admin side. Can I display a text message with an estimated delivery date instead of Delivery Date field on the checkout page? Yes, you can display an estimated delivery date text message instead of the delivery date field by selecting Text block in Delivery Checkout options under General Settings -> Date Settings tab in the Order Delivery Date on the admin side. Can I have a particular time range between which I can deliver products? Yes, you can have your suitable time range. You can do this by selecting the time range in the General Settings -> Time settings tab in the Order Delivery date on the admin side. Firstly, you need to enable "Enable Delivery Time capture", then select the Delivery From Time and Delivery To Time from their respective drop boxes. In this manner, the time range will be created and time sliders will be displayed on the calendar with the set time range on the checkout page. Yes. 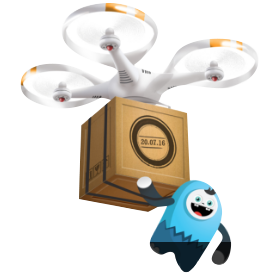 The Same day delivery feature enables you to get the deliveries for the same date. This is available in the Time Settings tab in the Order Delivery Date on the admin side. The current date would be available until the cut-off time set for the same date delivery is passed. Once the time is passed the date will be disabled and will have the label “Cut-Off time over”. Similarly, the Next day delivery feature works where the next day would be available for delivery. Can I set different same day cut-off times for weekdays as I have different working hours for different weekdays? Yes, you can set different cut-off times for different weekdays by adding them under Weekday Settings tab. This tab will be available only if “Weekday Settings” checkbox if enabled under General Settings -> Date Settings tab. Same day is available for deliveries even if the cut-off time has reached. Why so? You can see the same day available for delivery in the calendar if you are comparing it with your local time zone and your local time zone if different than the WordPress timezone set under Settings menu. The same day delivery cut-off times will be calculated as per the timezone that is set in your WordPress settings. Can I disable the holidays for delivery on the calendar? Yes, the General Settings -> Holidays tab in the Order Delivery Date menu on the admin side gives the facility of adding a range of holidays with an appropriate name which will be displayed in the calendar on the checkout page. Yes, you can create the time slots under the General Settings -> Time Slot tab in the Order Delivery Date on the left panel on the admin side. Time slots can be added for weekdays as well as specific delivery dates added. Can I charge my customers if they want deliveries on certain days? Yes, you can charge your customers by adding additional charges to the delivery days/dates as well as time slots from the plugin. Charges for the days can be added under Weekday Settings tab. For time slot, you can add charges while creating time slots. Can I disable delivery date field for certain products on the checkout page? You cannot disable delivery date for individual products but you can disable it for the virtual products or featured products. Also, it can be disabled for the product categories. Can the delivery date be changed for already placed orders? Yes, the delivery date and time can be changed by the administrator as well as by the customers. The administrator can change it on WooCommerce -> Edit order page in the admin. And the customer can change it on the My Account page. To allow customers to edit the date, you need to enable "Allow Customers to edit Delivery Date & Time" checkbox under General Settings -> Additional Settings tab on the admin side. Can I add different delivery schedules for different delivery zones? Yes, you can add different delivery schedules for different shipping methods added for the default WooCommerce shipping zones. Apart from shipping methods, you can also add different schedules for different product categories and default WooCommerce shipping classes. Can I export the deliveries to another calendar for easy access? Yes, you can export your deliveries to the google calendar directly or manually by downloading ICS files. This can be done under Google Calendar Sync tab.